Cigarette bins are used through out the United Kingdom due to the 2007 law which introduced a smoking ban in all enclosed public spaces. So since 2007 it has been a necessity for bars, restaurants, public houses, clubs and work places must provide designated smoking areas for their staff and patrons to smoke outside. Failure by such establishments can lead to a £2500 fine for the property owner and a £50 spot fine for the individual caught smoking outside a designated smoking area. The cigarette bin is widely used in such designated smoking areas to counteract the litter caused by smokers discarding cigarette buts on the floor. 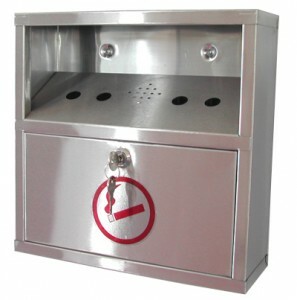 Cigarette bins come in several shapes and sizes with different features depending on the establishments requirements. 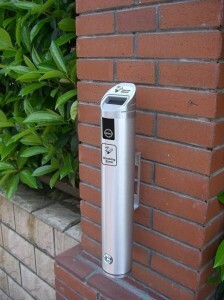 Wall mounted cigarette bins are available in different shapes, sizes and finishes. The majority of cigarette bins will have a lockable removable internal ash tray. They will also be fitted with a weather resistant hood to protect them from the elements. Please look at our online shop by clicking on the ‘Cigarette Bins’ category on the right or the direct link below.